At A&R Design we have over 40 years’ combined experience in designing and building a wide range of high quality home extensions. Many home owners require more space for various reasons, from a new addition to the family, to an office space or a change of layout, or simply to add value to a property. 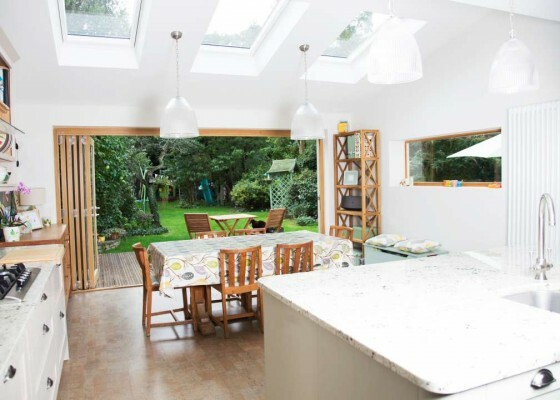 A home extension is a very popular way of achieving this, without the expense and inconvenience of moving home. Extensions allow you to add space, and can easily be designed for most intended uses. Extending existing rooms e.g. extended living space or kitchen or kitchen-diner. Adding new rooms, e.g. new office room, home gym, dining room, playroom, artist’s studio. Converting out-buildings and garages. into an office space or an extra room. We will manage all aspects of the project, from electrics and lighting to installing sliding and fold-back doors and windows. Whatever your requirements, we will draw on our extensive experience and work closely with you to design a space to fit your needs.